I famously hated training. I basically stopped training in 1991 and relied solely on my "talent" (talent = playing way too much sport as a child) and playing matches. I didn't hate training a little bit - I hated worse than Agassi hated tennis. I would have rather worked as a janitor than do fast multiball. I got kicked out of the Australian Team for the 1995 World Championship for refusing to train. I was selected and then removed. In 1997-98 I moved to a remote town and didn't train once in 5 years. I still played for Australia during these times as no one knew I didn't train and my results were sufficient. I made a few attempts to train over the years. The outcome was pathetic results, boredom and hatred for the sport. I famously liked playing matches. If someone called me and asked me to train, I'd reply with a strong "No, but we can play some matches". Can we play for $5 a game? Can we play till someone is injured or too tired to continue. Can we play a best of 31 games". Today I like training and playing matches. I'm even employing a coach to train me 3-4 times per week. How is that possible? The answer is, I'm working on my technique in a meaningful way. NextLevel is totally correct...meaningful = fun. I've gone from hating training to paying for it because it is now meaningful. I'm using the knowledge from the LTT series to play a decent backhand topspin for the first time in my life. I'm using LTT103 to block correctly for the first time in my life. I'm using LTT79 to effortlessly propel my arm with my left leg and hip. In the warm up, I can hit an infinite amount of forehand loops on in a row. When I was competing, I struggled to loop 5 in a row during the warm up and it actually hurt. I've always had good serves, but now I have a clear understanding of how to drive my arm. I can now serve without hurting my arm because I drive from the left hip. A few pages ago, I told you guys that LTT means more to me than the average man. I hated training because I had no idea of what I was doing. What's the good of practicing your block when you know it doesn't work in a match anyway? No wonder I hated training! You do 10,000 hours of blocking training and then miss it by 3 feet every time someone slow loops in a match...no thanks! Just let me play some practice matches and cut to the chase. Just let me miss it in a match for $5. The answer for me to have fun training is working on my shots with correct information. It's the feeling of being on the right track and working towards cementing proper shots that stimulates me. My brain is now shooting off dopamine in training as opposed to boredom. Previously, I was hitting the ball all wrong and I knew it. It was no fun because it had no real meaning. I'm also working on integrating my shots into match-play through visualization, training and LTT106 type stuff. I'm using another creative technique which I'll make a LTT video about. What about my rating, you ask? You're kidding, right! The above has zero to do with ratings. It's about me trying to enjoy my life for a few months. I'm using TT. Or think about how Xu Xin or Fan Zhendong may feel sometimes when ZJK was on the team. Definitely not easy. But it is clear that it always happens and has to be put in context. A friend of mine recently asked Fan Zhendong for a CNT playing shirt. Fan replied, "I can't give you a shirt until I make the team for the Olympics, then I'll give you one of those shirts". It's a true story. Fan thinks of himself as a bit of a failure because he didn't get selected in the last Olympic team. Apparently being no.1 in the world doesn't cut it. Apparently desire never ends. When does that man finally get to succeed? Btw, I've hacked Brett Clarke's account and this wasn't his opinion and he isn't responsible for what is written above. Oh my goodness. This is actually a buck cheaper than the M8. Not only is it in my price range, it's in my weight range as well. And.. it's got "lymphoid face material" .. How can I not order one?? Don't know about the carbon - they can't seem to make up their minds whether it's got carbon in it or not. I mean, yeah, wood has carbon in it, but... this looks like a 7 ply with a Clipper-like 3 ply core. Another plus - it comes in penhold (I know some people who might want one). It arrived today. Yeah, like the photo, no carbon (which might be a plus), and it's 91 grams (not in my optimal weight range). It is a 7 ply. Ah well, I'll stick a couple of old sheets on it and we'll see how it plays. 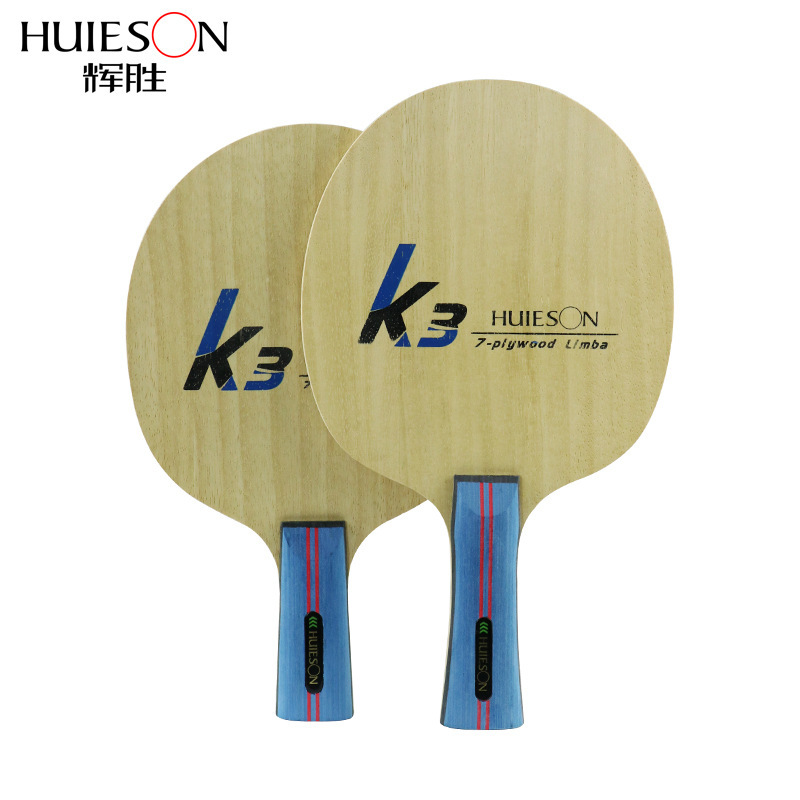 It does look quite natty, build quality seems OK (or at least comparable to Sanwei). It did come in three weeks - AliExpress parcel delivery is getting slower and slower these days, I got another package (not table tennis related) today that I had ordered 2 months ago. I knew you couldn't resist Iskandar! I've bounced a few ball on that blade and it has a good pitch and it's hard to go wrong for $7. Here's one for the EJs. If you have a bottle of thick glue, you can add baby oil to make it thinner and turn it into speed glue. About 3-4 parts thick glue to 1 part baby oil works well. Just pore the baby oil into your glue and shake hard for a minute or two. When you apply this "speed glue" to your rubber and blade, it will take about 20-30 mins to dry clear. Then you can stick your rubber on the blade. You should probably wait a few days before using your racket as the baby oil will still be working it's magic on your rubber and it will feel soggy if you use it. I used DHS glue and Johnson's baby oil. My DHS glue was way too thick, so it probably saved the glue from being thrown out. It also gave me a lot more glue. If you think that using baby oil is cheating or something, this isn't for you. If you have thin glue, this isn't for you. If you could transfer your current knowledge back to yourself in 1991 what difference would it have made to your career do you think? As for the baby oil is that essentially a short cut mini boost? Why not just use speed glue anyway? Guys at my club use it, just let it lie for a few days and it's undetectable and no one checks anyway supposedly. If you did 10,000 blocks in training, why would you not improve just from seeing whst the ball does and making it do more like that? Like you said, most great players couldn't explain how they do something in TT, it's like walking. Being able to learn to do a skill perfectly, without needing to intellectually understand it, is that talent? If your technique is wrong, you can hit the ball a million times and you'll probably see very slow improvement. Sometimes you actually start to get worse because you lose confidence in the shot. You have a panic attack every time you're required to play that shot under pressure. As the ball is coming, your brain/attentiion fades out and you can barely see. I've been there. Forget 10,000 blocks...Henzell probably did 10 million. Yet LTT103 is a real video. If you have the right technique, it's perfectly okay to not know what you are doing. If you have poor technique, you have a problem. If you push and pull your arm around too much, you have a problem. If your body and arm are doing unrelated things, you have a problem. Most children learn correct technique by imitating good players around them. Some things slip through the cracks though and that's how weaknesses start. It's not exactly about talent. You get one or two moves wrong and then you are in trouble. I'm not the best at imitating, so I got most of them wrong. Show me a dance move and I'll mess it up more than anyone you know. I'll need a good coach to show me how I'm getting the dance move so wrong and exactly how to do it. I'll start with the glue question. It is a mini boost and a thick glue saver. I believe using real booster can actually be dangerous for you health too, although I'm not a chemist, so I don't know for sure. You shouldn't use old speed glue because it's definitely dangerous for your health and it can be detected by sensors months after messing with it. I've coached players who have been removed from international tournaments because they messed with illegal glue a few months before. In one instance, I was forced to play myself in the World Teams Cup because we didn't have a 4th player. I had been retired for 4 years and I really didn't feel like playing, so I wasn't a happy coach. In relation to your 1991 question, it's something I think about a lot. An even better question would be, what if I coached myself from 1982? I would have taught myself to play correctly but, more importantly, I would have managed my own playing career better. Helping players to manage their life/playing career is now an unfortunate strength of mine. It's the reason I've been consistently advising no.1 Australian players over the last 12 years or whatever. It doesn't pay well today! In a few weeks (or maybe months), I will be responsible for 80 professional (paid/funded) junior players. Try to get your head around that. The story about hating to practice because it all made no sense is really interesting. I love to practice the new things TTedge shows me. I'm pretty sure it has made my current rating worse but I know my potential is less capped now. Honestly I really enjoy working on the new techniques and trying to add them to my game, only to break them down even further. I've probably recreated my forehand 4-5 times in the last 2 years and I'm about to redo my backhand for the 3rd or 4th time. Each iteration seems to get closer to uncapped so they seem to take a little less effort to add in. I'm probably addicted to learning new things in TT and that's fine. I'm the guy endlessly upgrading his computer/car and as a result it's never running really well. Looks like those kids will be in good hands! Interesting idea - I'd never thought about mixing organic oils with water based glue. I suppose it'd be akin to salad dressing - little oil globules suspended in a water-based emulsion. Yes, it would be boosting - apparently what is sold as booster is mostly the same as what's in baby oil, probably a little thicker. And baby oil is, incidentally, just slightly thicker, highly refined and distilled kerosene. We know what's in booster because ITTF commissioned a study, and the results were in a letter, and this letter (in French) was on one of those EmRatThich videos. If you think about it, it would have been really surprising if the ITTF HADN'T wanted to find out what was in booster, since "bat doping" is supposedly such a problem, even among the top ranks in the sport. I wonder if one of them will be a tiny minicadet girl named Shreya. She was at B75 the whole time last summer, and I think the coaches said she was top 10 for her age. So the first few we messed up, then I couldn't block a few of her opens, then she blasted a few fhs across. Finally I made a really nice punch block that skidded off her bh corner and she couldn't even touch it. No time passed, she grabbed the next ball, served, I push, and her bh open she placed so wide off my bh line it was completely impossible to block it to her wide fh. I started laughing out loud, it was so beautiful and so funny. Nobody told her to do anything different, and it was only a drill. But I beat her one time and the next ball she broke the drill to place it where I could not possibly beat her the same way again.. It was like automatic. I was seriously impressed. You probably had to be there, as even the other people in the group didn't get what I had experienced and just thought I had a very defective sense of humor. But to me that was an insight into what it takes to compete at national level. The competitive nature, and the instinct to not get beaten the same way twice, not even in a drill, it blew my mind. DTT28 is something that I do every single training session. I've talked about it in this thread, but I think the video is worth watching and you should start doing it immediately. Warning - The above glue will eventually give you cancer or something bad like Trichloroethylene poisoning of the liver. Rema Tip Top was the most popular brand until TT companies started copying it and selling it at higher prices, of course. A friend of mine ended up in hospital several times because he was making his own and mixing it in bucket. He was then putting the glue in cans and selling it. Player were sometimes applying it with their hands, which is unthinkable today. If you do the baby oil mix thing, let it dry off your blade for a really long time. I think overnight is best, if you want to use your racket immediately after. Depending on the final thickness of the glue, it might remain soggy for weeks if you don't let it dry some. Young kids can become extremely competitive when they come from an environment where there are massive player numbers. India is working it's way up towards 1 million players. Yes. I am working on this even in matches. But it is going to take a long time to deal with all the different returns. And I find that the forehand block/counter for me is a bigger deal. I think stepping back and just top spinning the ball may be the best even for me.